HINCHINBROOK (AUS) (Bay 2007-Stud 2011). 2 wins at 2, AJC Skyline S., Gr.3. Leading Aust. First Season Sire 2014-15. Sire of 213 rnrs, 129 wnrs, 11 SW, inc. Press Statement (BRC JJ Atkins S., Gr.1), Whispering Brook, Derryn, Diamond Tathagata, Salsonic, Samara Dancer, Flying Jess, Spright, Flippant, Manaya, The Virginian, SP Beat the Clock, Knowable, Super Too, Brazen, Brooklyn, Old Trieste, Un de Sceaux, Brulee, Nina Peak, Brooklyn Storm, etc. AL NOVA, by Al Samer. 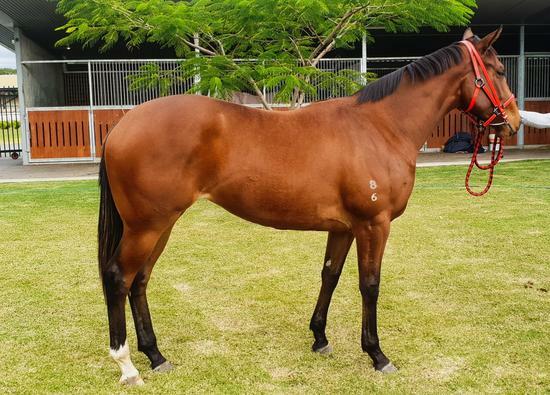 7 wins-2 at 2-to 1250m, A$156,030, Port Macquarie RC Queen of the North H.-twice, 2d ATC Tab.com.au H., 3d ATC Yellowglen H. This is her second foal. Her first foal is a 2YO. Al Nova. 7 wins. See above. Artova. 5 wins-4 at 2-to 1300m to 2016-17 in Aust. Harnova. 3 wins at 2 in 2016-17 in Aust. Ad Finem. 2 wins at 1000m, 1400m to 2017-18 in Aust. Hay Point. Winner at 1½m, 3d Leopardstown Club Members H., Curragh Kilsaran International S.
Mahoton. Winner at 1200m in Japan. MAMOOL (In the Wings). Champion Older Male in Germany in 2003 (Long). 8 wins-1 at 2-from 1600m to 3250m, £233,005, €641,450, 25,498,611L., 210,000Dhs in GB, Germany and U.A.E, Baden-Baden Grosser Preis von Baden, Gr.1, Cologne Preis von Europa, Gr.1, Yorkshire Cup, Gr.2, Kempton September S., Gr.3, Royal Ascot Queen's Vase, Gr.3, Goodwood Glorious S., L, Nad al Sheba Khas el Dhaheb S., Goodwood Uniq Foodservice Gold Cup 2YO S., 2d Newmarket September S., Gr.3, Newbury Washington Singer S., L, Newmarket Pina Colada 2YO S., 3d Newbury Geoffrey Freer S., Gr.2, Deauville Prix Gontaut-Biron, Gr.3, 4th The St Leger, Gr.1, Milan Gran Criterium, Gr.1, Newbury Geoffrey Freer S., Gr.2, Lingfield Derby Trial S., Gr.3. Sire. SCIACCHETRA (Manhattan Cafe). 4 wins from 2000m to 2500m, 144,585,000¥, to 2017, Nakayama Nikkei Sho, Gr.2, Hanshin Sakaiminato Tokubetsu, 2d Kyoto Nikkei Shinshun Hai, Gr.2, 4th Hanshin Takarazuka Kinen, Gr.1. Morgiana. 4 wins-1 at 2-at 1200m, 78,091,000¥, Nakayama Harukaze S., Maihama Tokubetsu, 2d Nakayama Christmas Rose S., Niigata Bakushin Tokubetsu, 3d Nakayama Nagatsuki S., Bloodstone S., Hanshin Sannomiya Tokubetsu, Kyoto Fujinomori S.
Doe Ray Me (Singspiel). 2 wins at 2400m, 2d Toulouse Prix Fille de l'Air, Gr.3, Chantilly Prix des Tourelles, L, 3d Toulouse Prix Max Sicard, L.
AVANZARE (Grand Reward). 8 wins from 5½f to 9f, US$549,305, to 2017, Del Mar Mile H., Gr.2, Santa Anita Arcadia S., Gr.2, Arlington Park Washington Park H., Gr.3, 3d Santa Anita City of Hope Mile S., Gr.2-twice, Del Mar Native Diver S., Gr.3, 4th Arlington H., Gr.3, Gulfstream Park Canadian Turf S., Gr.3. BLACK TIDE (Hold Me Back). 7 wins from 6f to 8½f, US$452,082, to 2017, Belmont Mohawk S., L, 4th Saratoga West Point S., L.
ZOSIMA (Capote). 3 wins at 2, Arlington-Washington Lassie S., Gr.3, 2d Arlington Park Silver Maiden S., L, 3d Royal Ascot Sandringham H., L, Belmont Athenia H., L.
GENOVEFA (Woodman). 2 wins. See above. Tibado (Forty Niner). 9 wins at 1m, 8½f, US$338,722, Santa Anita Allowance 4YO+, 2d Laurel John B Campbell H., L, 3d Del Mar San Diego H., Gr.3. Commanders Palace (Pleasant Colony). 3 wins-1 at 2-at 16½f, Saratoga Allowance 4YO+, 2d Fair Grounds Lecomte H., L, 3d Louisiana Derby, Gr.3. Prairie Smoke (Gone West). 2 wins-1 at 2-at 6f, Gulfstream Park Allowance, 3d Prairie Meadows Goldfinch S., L. Producer. ALY'S ALLEY (Alwuhush). Joint second on The 1998 USA 2YO Free H. 6 wins-3 at 2-from 6f to 9f, US$902,210, Turfway Park Kentucky Cup Juvenile S., Gr.3, 2d Breeders' Cup Juvenile S., Gr.1, Monmouth United Nations H., Gr.1, Saratoga Sword Dancer H., Gr.1. Sire. NORTH ATLANTIC (Ghostzapper). 8 wins-1 at 2-from 6½f to 9f, US$253,020, to 2017, Charles Town A Huevo S., L, 2d Charles Town West Virginia Breeders' Classic S., L.
SENECA DESTINY (Seneca Jones). 12 wins-1 at 2-from 4½f to 8½f, US$252,096, Sam Houston Park San Jacinto S., L, 3d Sam Houston Park Houston Distaff S., L.
CHIEF OF AFFAIRS (Yonaguska). 9 wins at 5½f, 6f, US$374,858, Indiana Downs James Whitcomb Riley S., L, 2d Oaklawn Park Count Fleet H., Gr.3.